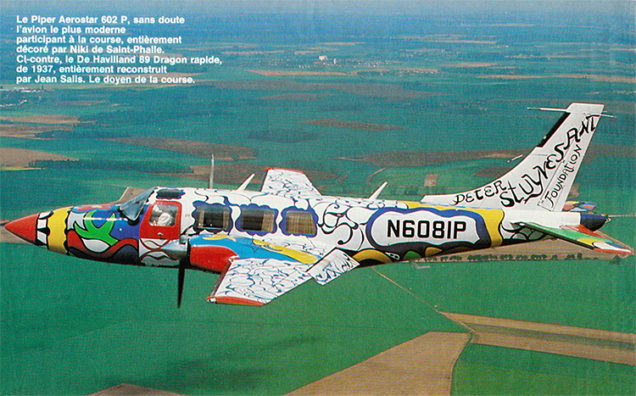 In 1980, the Peter Stuyvesant Foundation made an original proposal to Niki de Saint Phalle: devise a design for the exterior of a twin-engine airplane, the Piper Aerostar 602 P, that was to be exhibited at Le Salon du Bourget in France in 1981. The artist accepted and first painted a 32 by 31 by 25 cm model of the plane. 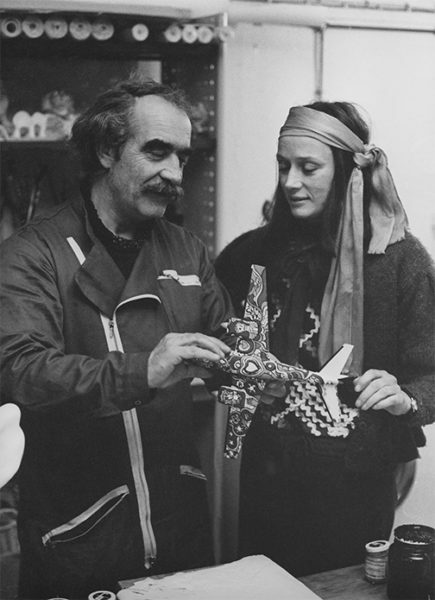 Picture of Niki de Saint Phalle and Jean Tinguely holding the Piper Aerostar model in his hands. © Leonardo Bezzola. She created a design in which some blue arabesques crawl along the wings, her painted flower elements blossom below the cabin and a big red nose finishes the front end of the fuselage. She also designed original and colorful outfits for the pilots. Because she was allergic to tobacco smoke, she added, under the plane’s belly, the logo “no smoking” as a mischievous nod to the famous cigarette manufacturer, sponsor of the initiative. On June 6 of 1981, the aircraft soared in the air for the first transatlantic, Paris-NewYork-Paris, air race with the French pilot Jean-Pierre Chauzit at the helm. The race lasted 3 days, 17 nations were in competition flying with single and twin-engined planes. The race was organized by the Aéroclub de France as a celebration of the 50th anniversary of the first East West Atlantic Crossing by the French pilots, Costes and Bellonte (towards the prevailing winds). as an entry in the first transatlantic air race." The Piper Aerostar 602 P painted by Niki de Saint Phalle was the most modern airplane in competition and arrived brilliantly in second position. The artist was at Salon du Bourget to witness its arrival. 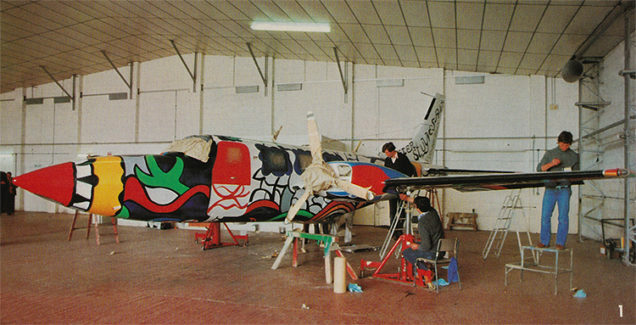 Few other artists were invited to paint planes before and after Niki de Saint Phalle. 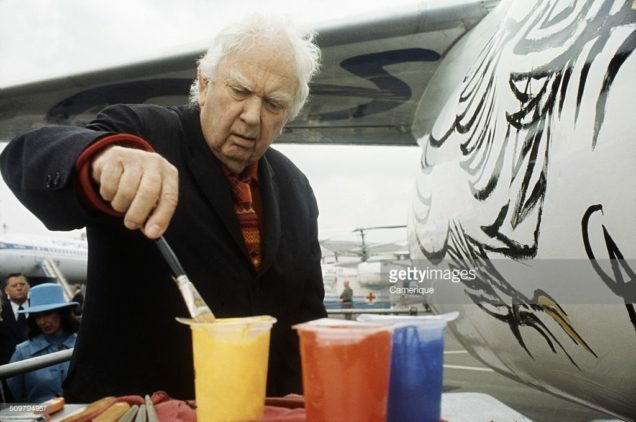 Like Alexander Calder, who was commissioned by the Braniff International Airways to paint two airplanes in 1973 and in 1975, one for South America in his signature red, blue, and yellow geometric shapes, and another for the United States in wavy red and blue swirls to celebrate the bicentennial of the Independence Day. Calder’s preparation models were shown at the Guggenheim Museum in New York in 2010. 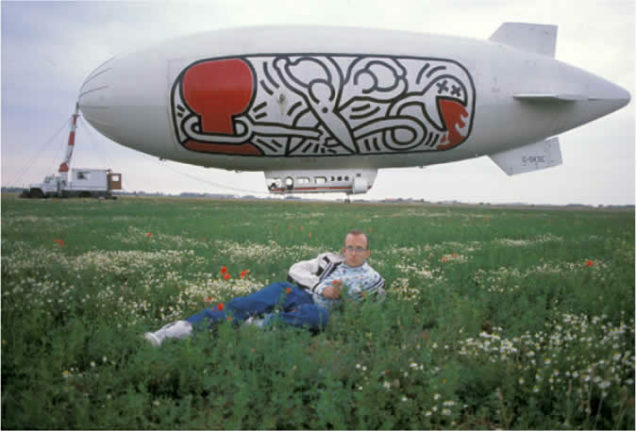 In 1989, Keith Haring, contemporary artist alongside Niki de Saint Phalle, was asked to paint a gigantic banner for an airship to be flown over Paris as part of Galerie Celeste, a project with Soviet painter Eric Bulatov commemorating the bicentennial of the French Revolution. Finally the latest spectacular example of painted airplane, is the one realized by Brazilian twins brother artists Osgemeos in 2014. They entirely customized the outside of a Boeing 737, aimed to transport the Brazilian Football Team during the last World Cup. They covered it with dozens of portraits, meant to represent the diversity of Brazil. They were rendered in artists’ signature style: yellowish-skinned figures with elongated faces and quirky outfits. Watch the whole process of painting the plane here. Can you think about other examples of Flying Works Of Art? Share them with us on Twitter @NikiCAFondation!